Speed off to new adventures in these 1:64 scale vehicles designed to represent characters from the incredibly popular movie, all in rich colors and decos as dynamic as their personalities. They're perfect for play or display! This Hot Wheels Jurassic World: Fallen Kingdom Character Car 2018 Wave 2 Case brings prehistoric creatures from Jurassic World to modern day rides! 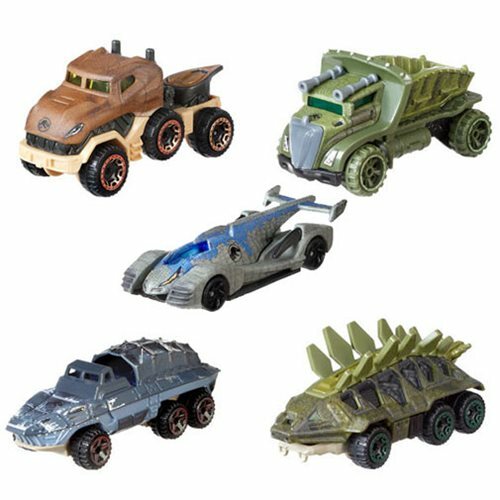 The Hot Wheels Jurassic World: Fallen Kingdom Character Car 2018 Wave 2 Case (999K) contains 8 vehicles.